You filed suit and obtained a Judgment against a debtor and afterwards you learn the Judgment debtor is married. Can you go after assets and income held in the name of the Judgment debtor’s spouse? Whether or not that is possible will largely depend upon the State in which the debtor and spouse reside. However, I’ll be attempting to answer that question with a focus on the law here in California, which is a Community Property state. If your Judgment debtor resides outside the State of California, you should confer with counsel in that state. 1. Community Property: This is property where both spouses own the property or asset jointly. All property and income obtained during the marriage and prior to legal separation, other than by a gift or inheritance is presumed to be community property [Ca Fam §760, 771 (a)]. This means that any property or asset fitting the description of Community property is jointly owned by both spouses. By extension, this means that those jointly held assets are indeed subject to seizure in order to enforce a Judgment against either spouse and this is regardless of whether or not both spouses received the benefit derived by incurring the debt [Ca Fam §910a]. Earnings or assets held prior to the marriage are not included as Community Property [C.C. 5120 110(a)]. However, “The earnings of a married person during marriage are not liable for a debt incurred by the person’s spouse before marriage. After the earnings of the married person are paid, they remain not liable so long as they are held in a deposit account in which the person’s spouse has no right of withdrawal and are uncommingled with other property in the community estate, except property insignificant in amount” [Ca Fam 911(a). Conversely, if the spouse of the debtor deposits new earnings into a bank account held jointly with the Judgment debtor, that money can and will be considered Community Property and can be seized to pay the Judgment even if the debt was incurred prior to the marriage. Any attachment of the earnings of the spouse in a wage garnishment must first require a Motion in Court and a resulting order by a Judge. 2. Separate Property: This includes property and assets obtained by one spouse (including inheritances) prior to the marriage. According to the California Family Code, the intended spouses can indeed form an agreement prior to their marriage to define the separate property of each spouse [Ca Fam Code part 5, Ch 1, §1500]. That agreement is called a “Pre-nuptual Agreement.” Married couples can also enter into an agreement called a “Post-nuptual Agreement” to set out how they would split up the assets if they were to divorce. Without a pre-nuptual or post-nuptual agreement, California law assumes the property/assets would be divided 50/50. It is important to note, however, that post-nuptual agreements can be subject to review to determine if they are formed as a fraudulent conveyance to avoid or hinder collection of a debt [IRM 25.18.r.11]. Repeatedly, the Courts have held that even when a spouse is not personally responsible for the debt of the other spouse, their Community Property can be used to pay the obligations of the debtor spouse. 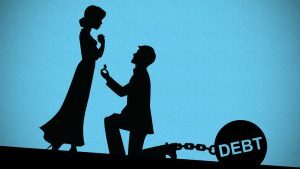 Their separate property cannot be used, however, to satisfy the obligations of the debtor spouse [Robertson vs Willis, 77 Cal App 3d 358 (Cal Ct App 1978)]. If you have a Judgement against a debtor, and you know the spouses place of employment, you can indeed have your lawyer obtain a writ of garnishment against that income source. There may be other assets also held by the non-debtor spouse, which can also be subject to attachment in order to satisfy the debt owed to you. Consequently, full due diligence should be done as to the non-debtor spouse to determine those potential assets. Conduct a full examination of the spouse under oath, obtain a credit report, and search social media – all in an effort to discover potential assets and income streams of the spouse. Dave Greenberg began his career in commercial collections with Dun and Bradstreet in Seattle, Washington. After spending 8 years with D&B, Dave took a position with ABC-Amega Inc. Over a 32-year span, he vastly expanded their international department and became an industry leader in the commercial-international niche sector. He was a Past President of the California Commercial Collection Association, on the panel of commercial arbitrators for the American Arbitration Association, and the Council of Better Business Bureaus, while also remaining active in the US Air Force Reserve. He is a co-author for both FCIB and ICTF for their online credentialing courses for international credit management offered through Michigan State University and Thunderbird School of Global Management. Over the decades, Dave traveled the world, providing speaking engagements to credit grantors from Cyprus to Germany to China. He currently serves as Legal Liaison with the Law Offices of Gary A. Bemis. Dave is also an author of children’s books and, along with his wife, recently moved to California to be closer to their grandson.